Our November 6, 2018 ballot layout was approved this week and has been sent off to our printer – yay! Meanwhile, we’ve posted a sample ballot on our website. This year, everyone in Arlington votes the same ballot. Voters often ask our pollworkers how the order of candidates is determined on our ballots, and that’s a very good question, as well as a practice that varies from state to state. In general, candidates find the first position on the ballot as most favorable, which is why some states randomly rotate ballot positions among candidates to try to diminish any perceived preference. 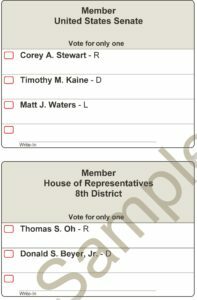 While Virginia doesn’t rotate ballot positions, there is some logic to the way candidate names are positioned. Each year, the Virginia State Board of Elections (SBE) conducts a drawing to determine which of the two major political parties – Democratic and Republican – will have their nominees listed first on the ballot. This is followed by a second drawing to determine the order for any third-party candidates (Libertarian, Green, etc.). Independent candidates follow party nominees, listed in the order in which they submitted their qualifying documentation. 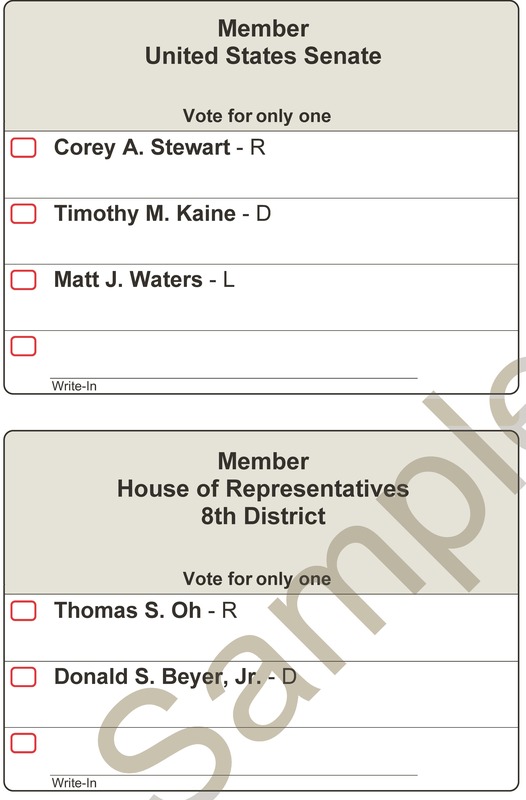 In 2018, the SBE drew the Republican Party first, so ballot order for U.S. Senate, for example, is Republican Corey Stewart first, followed by Democrat Tim Kaine, and lastly Libertarian Matt Waters. All other offices on the ballot follow the same pattern: Republican, Democratic, Libertarian (provided there are party nominees), and independent candidates in filing order. Sounds pretty simple, right? Well, it is very clear for federal and state offices, because party affiliation codes for those candidates appears next to their names on the ballot. Not so for local offices, however. In accordance with state law, no political party affiliation appears on the ballot for any local offices, which in Arlington for 2018 includes County Board and School Board. No big deal, you might think. Aren’t candidates for those offices also listed in the same order as determined by the SBE’s drawing. Well, yes and no, and this is where it can get a bit confusing. 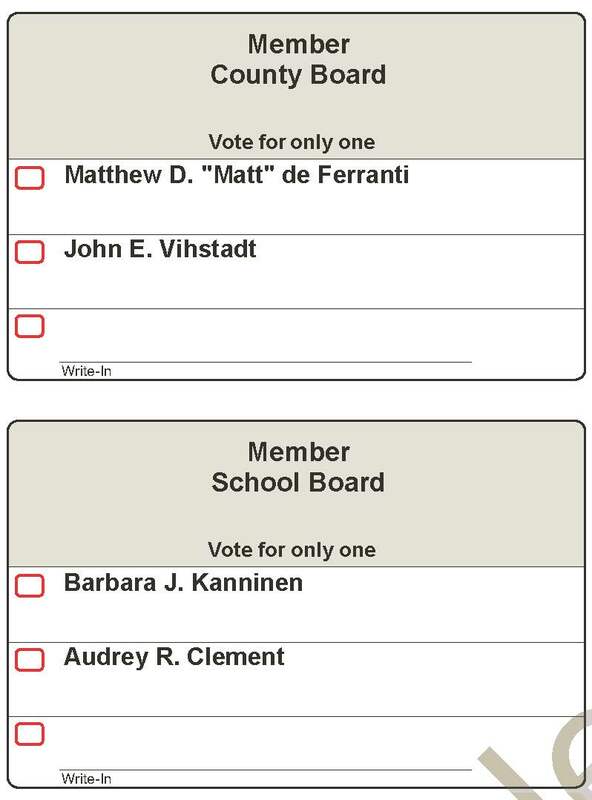 Political parties can nominate candidates for County Board, so one might reason that Matt de Ferranti is a Republican nominee and John Vihstadt is a Democratic nominee by virtue of their respective first and second positions on the ballot. That is not the case, however. Because there is no Republican nominee in 2018, de Ferranti, the Democratic nominee, is actually listed first. 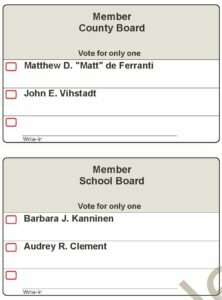 Vihstadt, on the other hand, is running as an independent candidate, so his name follows any party nominees. Confused yet? Then there’s the School Board office, with two candidates listed this year. Under Virginia law, all School Board candidates must qualify for the ballot in the same manner as independent candidates. This doesn’t mean they have to be non-political, only that they qualify for the ballot in this manner. They can, and often are, supported or endorsed by a local political party. This is true for Barbara Kanninen, who is endorsed by the Democratic party. Although she qualified for the ballot following requirements for independent candidates, she is campaigning along with other Democrats on the ballot. There is nothing in Virginia law that prevents this. Because Kanninen and Audrey Clement qualified as independents, they are listed on the ballot in the respective order in which they filed – Kanninen first and then Clement. Almost every year, legislation is introduced in the General Assembly to permit party affiliation on the ballot for all offices, but the legislation fails at some point. There are some legislators who believe that local offices should have the appearance of being non-partisan. Indeed, in many cities in particular, all candidates for city council run as independents. Ballots Were Even More Confusing in the Past! 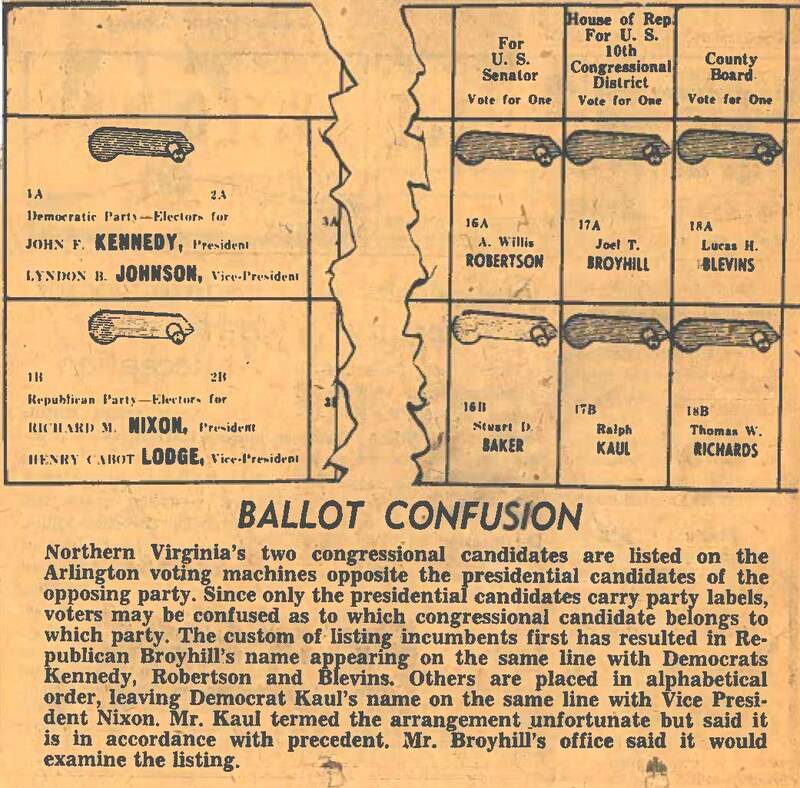 If you think ballot layout is confusing today, it was even more so years ago. Until the early 2000s, the office of President was the only ballot office in Virginia where party affiliation was indicated at all. This lead to some confusing ballot designs on the other offices, not only because of the lack of party affiliation but also due to an earlier rule that entitled incumbents to the first ballot position in all offices except President. The mechanical voting machines used and limitation in their layout also contributed to the confusion. In the 1960 Presidential election, the Democratic ticket of John F. Kennedy and Lyndon Johnson occupied the first position for that office, followed by Republicans Richard Nixon and Henry Cabot Lodge. 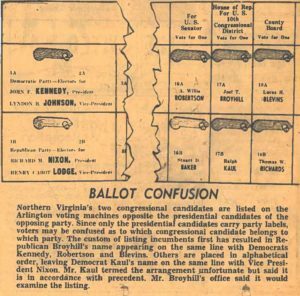 In the race for House of Representatives, however, incumbent Joel Broyhill, a Republican, was listed first, on the same line as Kennedy. And Democrat Ralph Kaul appeared on the second line, along with Nixon. To add to the confusion, the candidates for Senate and County Board listed on the first line, where Broyhill’s name also appeared, were incumbent Democrats! The confusion really came to a head on the 1976 ballot, where there were five political parties with Presidential nominees. The problem, according to an article in the Washington Post was that the SBE held one drawing for party order for the Presidential race, and a separate drawing for party order in all the other races, even though party affiliation wasn’t on the ballot for the other races. Because, again, of limitations of the mechanical lever machines, the result was confusion over perceived party affiliation for the non-President offices. The order for the Presidential candidates was Labor, Republican, American, Democratic, and Socialist Worker. Candidates for the other offices were listed in Republican, independent, and Democratic order. This lead to Republican or Democratic nominees for the non-Presidential offices being listed to the right of Presidential nominees that were different from the parties those candidates represented, as well as independent candidates listed to the right of major party Presidential nominees. Both the Republican and Democratic committees in Fairfax County sued the state over the “confusing” layout. The local political party committees in Arlington filed suit with the Arlington Electoral Board for the same reason. The Virginia Supreme Court ultimately ruled against the Fairfax committees, saying that “mere voter confusion is no reason to change the layout of the ballot.” Arlington’s case was subsequently dismissed as a result of the Fairfax ruling. At least we now have party labels for all federal and state offices. Perhaps one day we’ll see party labels for local candidates, too. It won’t be in 2018, but in order to assist our voters, we do post party affiliation information and incumbency status next to all candidates on our web page, even though it doesn’t appear on the ballot in all cases.